Today, there is an increasing demand for high quality, personalized treatments for diverse pathologies including cardiovascular diseases, cancer, obesity and diabetes. The molecular research that underlies new treatment development is largely propelled by material and informational support provided by bio banks.However, putting bio banking on the map of the healthcare system calls for the proactive participation of medical institutions, community medical centers and policy makers. Though the sector is still growing, a handful of women entrepreneurs are leading this change from the front. Dr.Jugnu Jain, Co-Founder and CEO, Sapien Biosciences, is one such woman, who has been changing the landscape of bio banking in India, while breaking several stereotypes. With 26 years of professional experience in the U.S. and UK, Dr.Jugnu decided to take the biggest risk of her life by quitting her job at Vertex Pharmaceuticals, a top biotech firm and establishing her own venture in India. She always had the desire to use her skills and experience for the welfare of the Indian population. Fortunately, Dr.Jugnu happened to reconnect with her former Vertex colleague Sreevatsa Natarajan, who was planning to start a biotechnology firm in Hyderabad. As their ideas resonated, they co-founded Sapien Biosciences – India’s first commercial bio bank in 2012, with a vision to be a premier global biotech firm that employs human translational platforms for the discovery and development of novel diagnostics, bio markers and drugs with better clinical outcomes. A post doctorate from Harvard University, UK, Dr.Jugnu’s major challenge was lack of funds during the initial phase of the entrepreneurial journey,as most of the funds and fund houses in India are actually private equity, rather than VCs, especially in life sciences. A majority of them prefer to make safe investments in companies, which have already shown proof of concept and generated revenues. The government has introduced various funds for new entrepreneurs in the life sciences sector, but there are many regulations that limit access to these funds. “We did not receive any government grants until last year when we won a GITA-DST award. We have also had to battle the perception that we should not be given grants, especially government funds, simply due to our partnership with Apollo Hospitals,” claims Dr.Jugnu. This stereotype is changing and she hopes collaborations and grants will be more accessible in the future. Her experience of working at Vertex enabled Dr.Jugnu to contact many potential clients, understand their work culture & requirements, and provide them the right solution. She has deep contacts & networks in the industry globally and connects with them regularly to gain advice & business leads. These contacts have enabled her to take Sapien Biosciences to international platforms and build partnerships globally. Dr.Jugnu never learnt the habit of saying ‘No’to any work, which does increase her work load. Her father’s transferable job and her own education across many cities has helped make Dr.Jugnu a very adaptable person, who can handle change with a calm and positive attitude. She asserts,“As an entrepreneur,you should be flexible and willing to work under sub-optimal conditions,often with limited resources; these things are easier for me to handle as I have lived in different countries under different conditions”. Her co-founder’s exit from the business last year left her with additional responsibilities. But, as we know, Dr. Jugnu is a strong woman and her dictionary does not have the word ‘impossible’ in it. She has simply worked harder along with her experienced management team and learnt the financial and compliance aspects from Sreevats a to shoulder the additional burden capably. Dr.Jugnu does not believe in the term ‘woman entrepreneur’ and asserts that the playing field should be level for men and women and we should encourage risk-taking, irrespective of gender. 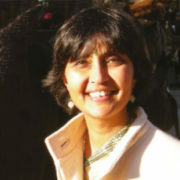 She considers herself first and foremost a professional, taking pride in being a scientist, and then only a woman.“Only during my MSc, I was picked on and harassed as I was the only girl in my entire class.But everywhere else,in India, the UK and USA, I either had or was able to build multi-cultural environments that respected expertise and knowledge over and above gender, caste, nationality,etc,”says Dr.Jugnu. Moreover, her family always motivated and supported her during thick and thin. She strongly believes that there is no separate work and home life.“We have only one life. If things don’t go well in the home life, then that impacts our work life and vice versa. So it’s best if we can bring harmony between the two,” adds Dr.Jugnu. On this note, she tries to take short vacations now and then, to explore new places in India and abroad. The need to stay abreast of the technological advancements in life sciences and the desire to enhance her understanding drive Dr.Jugnu towards reading technical journals, participating in conferences, writing blogs and forming networking forums in life sciences. Managing a one-of-a-kind business, hiring and training people, as well as establishing global partnerships, give her immense satisfaction and joy and add more meaning to her life. Two diagnostic tests have already been launched that help in optimizing treatment for cardiovascular and breast cancer patients she says, and more innovative diagnostics are in development at Sapien. For motivation, Dr.Jugnu advises new entrepreneurs to follow Vivekananda’s writings on work ethics,the biography of MarieCurie on singularity of purpose, and the Stanford commencement address given by Steve Jobs on setting goals for one’s life.